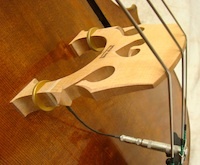 “The Revolution Solo” transducer piezo element is embedded in a piece of spruce, and wedged under the bridge wing. Different sounds can be achieved by mounting the sensor with either one or the other side facing upwards. “The Source” pickup is based on the Revolution Solo pickup, but built into the bridge’s leg permanentely. I traded my Underwood for a Revoluton Solo 3 years ago. Nothing wrong with the Underwood, but the Revolution made a huge change in my amplified tone. 1950’s factory German DB -> Thomastik Dominant strings -> Rev. Solo pickup -> Acoustic Image Contra Series Ia amplifier. I mainly play jazz, blues, and latin on my DB so I wanted a really punchy, dark sound. Sounds great through the whole range, really “softens” thumb position which can with certain pickups get kind of “plinky” if you know what I mean. Also sounds very nice for arco, although I suppose most performing classical players would be mic’d.